Discover Leuven. Visit Park Abbey in Heverlee, just southeast of Leuven. Visit Park Abbey on the outskirts of Leuven : a great place to walk, jog or cycle. Guided visits on sunday afternoons. Park Abbey is (was) a Norbertine abbey, located just southeast of the city of Leuven. Buildings have a seventeenth to eighteenth century appearance, but the layout and landscaping of Park Abbey date back to medieval times. No new buildings were added since 1730. In 2003, the abbey grounds were let to the city of Leuven on a long lease, and the Park Abbey Museum was set up. Officially, Park Abbey was founded in 1129. 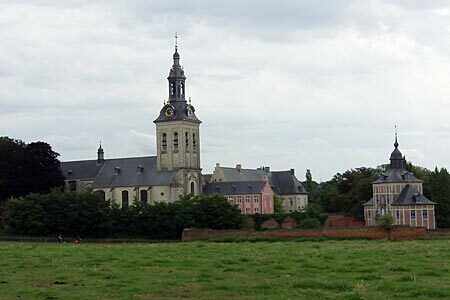 The first Norbertine abbey had been founded just a few years earlier in 1121 in Prémontré, at a time when many abbeys were founded in the low countries. The foundation itself was an initiative of Godfrey the Bearded, the Duke of Brabant. Soon the abbey flourished, and expanded in size and importance. Abbey grounds expanded in surrounding villages and areas. At its peak, the abbey owned or controlled 2,472 hectares of land, with 21 large and medium-sized farms. In later centuries, Park Abbey had its ups and downs, and the abbey suffered during the religious wars of the sixteenth century. However, if flourished again during the seventeenth century. In 1797, the abbey was closed, at the time of the French revolution and occupation of present-day Belgium. Park Abbey was founded a second time in 1836, but without the large properties in surrounding areas. The abbey became involved in missionary work in Brazil. The abbey prospered until the second half of the twenthieth century. Then it was unable to escape the downward trend in religion beliefs and monastery life in Western Europe. The number of callings declined, with ever less remaining canons at the abbey. At present there are only 2 or 3 elderly canons staying at Park Abbey. There is a certain sadness about the place. When entering the refectory, that can seat tens of persons, one notices only the two prepared breakfast and dining sets on one of the tables, with a thermos jar of coffee prepared for the two remaining canons, to last the whole day. 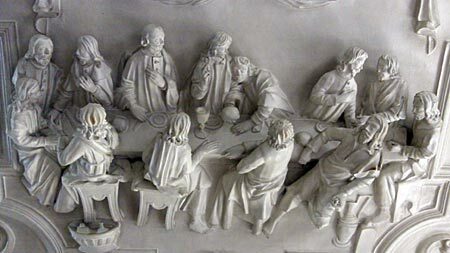 Stucco representing The Last Supper, on the ceiling of the refectory at Park Abbey. Park Abbey is located on the outskirts of Leuven, and can be reached easily on foot or by bike. Access at present by car is a bit difficult because of road works in the surrounding areas. The abbey grounds are open to the public, and there a quite a number of people walking and jogging about the place, or cycling around. Abbey grounds are open between 10 A.M. and 5 P.M., except mondays and tuesdays, during the summer months (april to september). We can recommend the guided tours on sunday afternoons. They last a little bit longer than one hour, and will allow you to visit important parts of the abbey like the library, refectory, cloister, dormitories etc. While large parts of the buildings are in disrepair, there are some stunning art works like the stucco carvings in the ceilings of both the library and the refectory, and stained glass art works. Stained glass, in the cloister at Park Abbey. 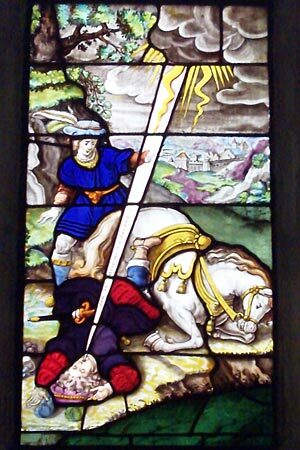 The moment is depicted when Norbert is converted. Update, source LevenInLeuven.be : Op 22 september ondertekenen de Stad Leuven , de norbertijnen van de abdij van Park , de KU Leuven en minister Geert Bourgeois een belangrijk akkoord dat de restauratie van de abdij van Park garandeert. Dankzij dit akkoord maakt de Vlaamse overheid een uitzonderlijke en eenmalige restauratiepremie vrij van 25 000 000 euro; voor de restauratie van alle abdijgebouwen. This is a substantial amount of money, I wonder how the abbey will look after the restorations are completed!